Please note that for 2018, I am fully booked and cannot take on new students. As I have very high standards for my private classes and want to be able to give my full attention to each individual, I only take a limited amount of students. If you are interested in private lessons, please send me an email to hello /at / juliakleinfeld.com and I will happily inform you once I open the books again in early 2019! Is private yoga for me? Private yoga classes are a great way to either start your own yoga journey, to deepen an existing practice or to get individual sequences for therapeutic or specific needs. Many of my private clients have pre-existing injuries and are looking for a safe way to move smarter. 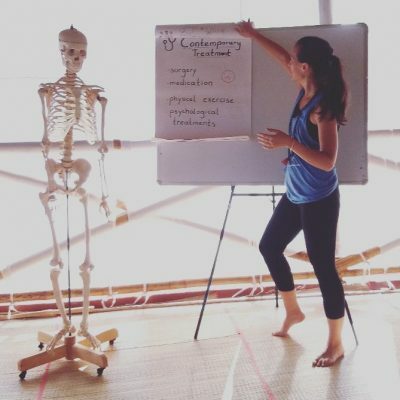 I combine yoga movement, mindfulness, breathing exercises and cutting-edge anatomy & movement research to help you move with ease or unlock habitual patterns in your body. Private Yoga Classes can either take place in your own home if you’re based in South Co. Dublin or we can schedule to meet in my practice room in Dun Laoghaire (10 min walk from the DART). Please note that I currently only do home visits to known clients or after meeting for an initial consult. If we haven’t met yet, but you’ve been referred by one of my students, make sure to let me know. Every private class is completely tailored to your specific needs. Please let me know of any medical conditions or previous injuries as well as your expectations. Most clients choose the 4×60 min package to be able to develop a practice to their own need. If you have any questions or want to schedule your first class, simply send me quick email or text. Please inform me of any injuries / medical conditions you may have before your first class. If you have questions, contact me via 089 2070410 or hello[at]juliakleinfeld.com. Copyright © 2018 Julia Kleinfeld. Get in touch via hello[at]juliakleinfeld.com or 089 207 0410.